We have seen how to use the main elements of Textpattern: pages, sections, forms and articles. There is one more element: categories. These are not essential to the functioning of a Textpattern website, but they allow us to refine how the website works. A Textpattern article is located in the structure of the website by being assigned to a section. It may be necessary for the purposes of a particular website for articles within the same section to be sorted or grouped according to their subject matter. It may also be necessary to sort or group articles from different sections that have the same subject matter. The Textpattern category feature allows you to do this. Take the example of www.crawleysussex.co.uk. The bulk of this website consists of an online directory of businesses and other organisations based in and around Crawley in Sussex. The directory itself comprises one section of the website. 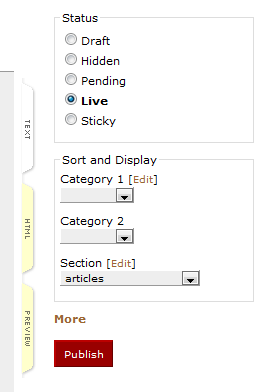 Within this section, the material is classified by category. Each entry in the directory is categorised by its type, such as butcher, baker or candlestickmaker (not many of those), and by its location. individual pages for each business or other organisation. 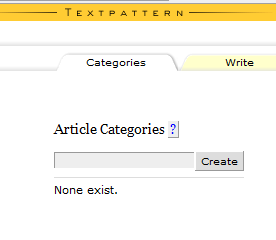 Textpattern’s default installation allows you to place each article in up to two categories. In practice, two categories will not always be enough. You will usually find that you need either none or a lot more than two. Fortunately, there is an excellent plug–in that allows you to create an unlimited number of categories. It is called rss_unlimited_categories, and is available from the author’s website and the main Textpattern plug–in depository. By default, a Textpattern page will function as an HTML landing page, and display a list of all the articles assigned to the section which applies to that page. We have seen how you can change the default settings so that the landing page displays a limited number of articles from that section, or displays articles from another section. This means: if the visitor has landed here by activating a link to a category, use the following code to display the articles according to their categories. This means: if the visitor has not landed here by activating a link to a category, use the following code to display the articles in the normal way. This is simply the end of the conditional statement. The conditional statement tags are the same whether you are using Textpattern’s two categories or the rss_unlimited_categories plug–in. The category–specific code, however, may differ. The various category tags that apply to the default installation are given on the Textpattern tag website. The options for the plug–in are listed here.